Dental implants provide those with an incomplete smile a way to replace their teeth securely while also restoring jaw health. 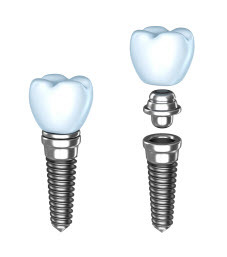 When you want a comprehensive replacement option for missing teeth, consider dental implants. Dr. George Duello and our dedicated team at the Master Institute of Implants & Periodontics provide quality dental implant services in St. Louis. If you want further information on how dental implants can improve your oral health and restore confidence in your smile, call today to set up a consultation. Since we provide specialized services, our patients are referred from local dental professionals entrusting us to co-manage their oral care. Because of this, we understand the value of patient education at the Master Institute of Implants & Periodontics. A well-informed patient not only develops a trust in our services, but they are equipped to decide the best course of treatment based on our initial evaluation. We make it our mission to provide excellent, personalized care so your visits are as comfortable and pleasant as possible. Your first appointment is primarily a consultation designed to prepare you for the procedure and answer any questions you have. We conduct the exam, take x-rays, and determine your exact goals for the treatment. We encourage you to look at our YouTube channel between appointments to hear other patients’ testimonials about their experience with specific procedures. In addition to internet resources, we offer written material explaining the benefits of your recommended treatment. At your second appointment, we share with you our customized and comprehensive PowerPoint presentation explaining our findings and our recommended course of action. Dr. Duello is one of the first periodontists in the United States to place dental implants using the Branemark surgical protocol. Whether you need failing teeth removed, want to restore health after years of wearing traditional dentures, our dedicated team has the expertise to better your oral health. Using Nobel Biocare implant posts, Dr. Duello provides enhanced stability and aesthetics. Your implants are precisely placed based on the step-by-step Branemark protocol. Whether you are replacing one tooth or several, you can achieve your desired outcome with little discomfort. When tooth loss has impacted the confidence in your smile, there are solutions that help support function, beauty, and jaw health. At Masters Institute of Implants and Periodontics, our patients benefit from expert dental implant services in St. Louis. If you would like to discuss your options with an experienced, caring professional, call our office to set up a consultation today!